You need experience in at least one of Android, iOS or Flutter development. This is a guide for mobile app developers. In this three-part series we are covering all the basics of what it takes to become a backend developer. In the first tutorial we went over background knowledge related to client-server communication. This included URIs, HTTP, REST APIs, and JSON. If any of these topics are unfamiliar to you, go back and review them. Now, let’s build a server! I'm not assuming you have any backend server experience, but I won't be repeating online documentation, so you will need to be able to following the installation directions from the links I give you. I will be using Visual Studio Code to do the server programming. Feel free to use another IDE if you prefer. For development purposes, we are going to install the server software on our local machine and have it communicate directly with our mobile app running in an emulator. Go to nodejs.org to download and install Node.js. // The require() function loads modules in Node.js. // A module is code that is in another file. // using the HTTP protocol and enables setting up an HTTP server. // During development we will use the localhost. // A header adds additional information. // media type (MIME type) as plain text (as opposed to html). // This writes a message and then ends the response. // the hostname and port that we defined above. Go ahead and test the code by running the app as described in the Getting Started Guide. You should see “Hello World” in the browser window when you navigate to http://localhost:3000. So we need to make our server handle all of these requests. First go to the terminal and create a new directory for our Node.js project. We are also going to use the Express framework, which simplifies a lot of the HTTP protocol handling. Save the file and run it in the terminal. The server is now running on your machine. You can use Postman (see docs and tutorial) to test the server now, or you can use one of the client apps that we will make in part three. If you have Flutter installed on your system, then Dart is already installed. But if not, then go to this link to download and install the Dart SDK. On Windows it is easiest to use the GUI to set environment variables. This only updates the path until you restart your machine. You will probably want to update your .bash_profile (or whatever you use on your system) to make it permanent. Follow the directions to add the $HOME/.pub-cache/bin to your path if you are instructed to. So we need to make our server handle all of these requests. Open the project in an editor. The Aqueduct documentation recommends IntelliJ IDEA, but I am using Visual Studio Code with the Dart plugin. // We are only setting up one route. // We could add more below if we had them. // A route refers to the path portion of the URL. The following is a model class that includes code to do JSON conversions. I’m including it here for your reference, but you don’t need to do anything with it today. For more help converting JSON to objects in Dart see this post. In this tutorial, we saw two ways to create a backend server. Although the details were somewhat different, the REST API that we implemented was exactly the same. If you don’t like Node.js or Server Side Dart, there are many more to choose from. (I was playing around with Server Side Swift for a while before I decided to pursue Flutter for the frontend.) Whatever server technology you choose, just implement the REST API that we used here. You can find the server code for this lesson on GitHub. 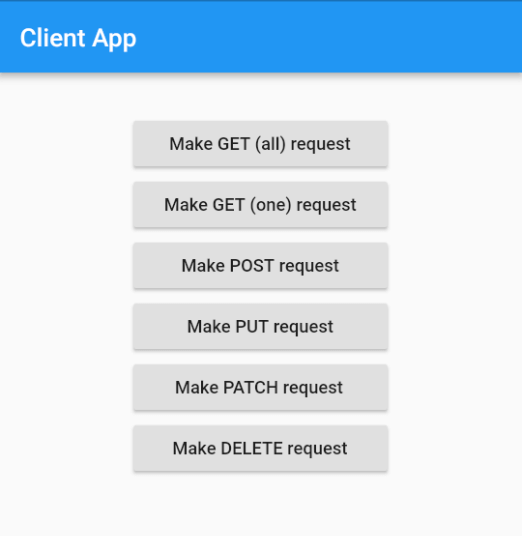 In the last part of this tutorial we will learn how to make Android, iOS, and Flutter client apps that are able to communicate with the servers that we made in this lesson.